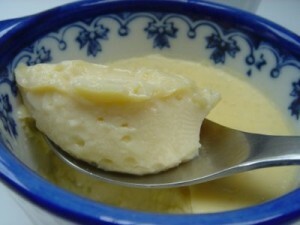 Basic Egg Pudding recipe by Mohammad Adnan Mirza at PakiRecipes.com. If you want caramel then proceed as follows otherwise skip step1. (step1) in the baking dish add the all the ingredients above for caramel sugar, butter, vanilla and water. mix them well and spread over the dish. Put the dish over low flame on your stove and stir constantlyuntil the mixture turns golden. Besure not to burn it. Turn off the flame and let the dish cool down. (step2) in a blender add the eggs, cream, sugar, vanilla and milk and mix it well. (step3) pour the pudding mixture into the casserole dish. Preheat oven 250 to 300 degrees and bake it for 20 to 30 minutes until the mixture sets and gets stiff. Check with a knife if its done or not. When its done chill it then serve.